Ten years ago, well, even five years ago, if someone told you about “tracking” a Buick, jaws would collectively drop most likely. Fast forward to this decade, and Buick has reintroduced the Regal name to the lineup, with a lot of influence from newfound cousin Opel. Yes, we’ve already driven the Buick Regal GS, but Buick specifically invited us to put it through its paces at the Autobahn Country Club in Joliet, Illinois. Also factoring into this drive is the 2016 Buick Regal GS’ fairly substantial price drop. Once ringing in at $38,310, Buick’s midsize sport sedan may now be had at $34,990, reflecting a $3,320 price decrease. And Buick is happy to point out all the content is exactly the same. Lower price, same content. Great, right? As long as you’re not looking for the six-speed manual transmission, as Buick has quietly phased the manual option out for the entire Regal line, making the six-speed automatic the only option. With this background information, we took off to the circuit and autocross course to see if a GS badge was truly earned. Foremost, the low-end torque arriving with the 2.0-liter turbocharged four-cylinder is superb. But, it’s a bit of an illusion. Peak torque arrives at 2,500 RPM, and maintains itself through 4,000 RPM. That meant engaging the “GS” button, and revealing its revised throttle mapping and more tactile steering feel, made for a lovely first impression leaving the pits. Unfortunately, the engine really begins to run out of breath come 3,800 RPM. Straightaways became the car’s worst nightmare on the circuit. Though, through the apexes, the 2016 Regal GS and its electronic limited-slip differential really inspired confidence, and the active all-wheel drive sent power accordingly where it was needed. 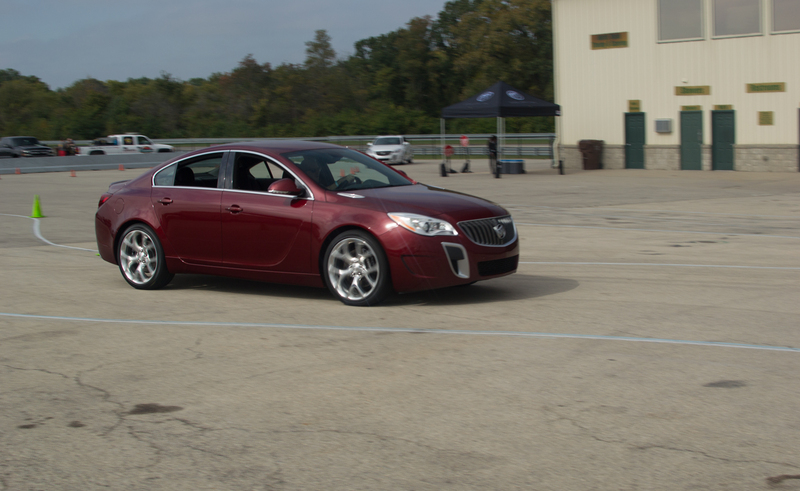 With those thoughts, we headed to the autocross track, where the 2016 Buick Regal GS proved a much better cone hunter than corner killer. 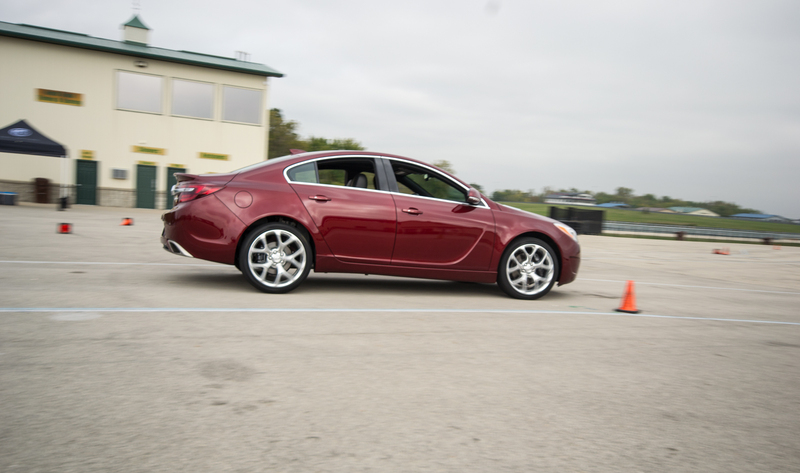 Yes, the steering feel is a bit vague, and body roll is abundant, but the 2016 Regal GS revealed a more playful character as it was tossed through the slalom of cones. Smiles ensued. We have a feeling this has something to do with keeping the 295 lb-ft of torque available at much lower speeds around an autocross setup, rather than revving it goodbye after 4,000 RPM on the track. The question then arose after our time with the 2016 Regal GS: does it do enough to be a true sports sedan? Yes, and no. It has a lot of the right sport sedan pieces and bits, but they all need to bake just a tad longer to truly earn a sport sedan title. But, there’s a reason Buick has kept this car around. The brand knows it has the start of something special here. It just hasn’t arrived quite yet. Consumer Reports ranked Regal GS ahead of Benz, Cadillac and Audi. I notice CR loves a bargin & high quality. Check out it’s last two years of sales figures. The Regal avoids buyers better than it does cones! But don’t worry – that convertible should more than make up for the Regal and the Verano. I think the Regal GS is a great car… it just needs a more robust engine under the hood for some better performance to match the styling! Just my thought tho! Just read about how BMW will be adding water injection for higher engine performance which makes you wonder whether Buick could adopt water injection in the LHU 2.0L 4-cyl turbo as BMW is getting a 20-percent jump in engine output as this would take the 2.0L turbo’s output to over 300 horsepower. The Regal has had the LTG engine since 2014. Such a niche car already, it’s not for the masses, so treat it as such when it comes to GM engines. Nice styling, great wheel choice that is not out of the GM parts bin. Back end looks great, side profile not bad. Front end could be changed a bit, but outside of that, its a nice mix of sleeper and style. Sounds like the handling and braking are very good. So why jam that engine in it? V6 at least. Now with that said the Regal is still a very good car. But we also need to qualify this. #1 the Regal is an older car and platform at the end of it’s cycle. The coming model will be here soon and make a impact on the segment. #2 The Regal is not a track car. It is fun and sporting to drive but it is tuned more for sporting performance on the road than track. #3 for the money it is a lot of car with the AWD. As for the Water Injection. It is not needed. First it is a pain as you have to refill it. Most owners will not do that. Second you can add more boost on pump gas here and still make this car make over 300 HP. The key is to make it Premium Fuel Required not Recommended. GM likes to keep this option available and if they so it also keep the Power down a bit. My LNF version of this engine is right at 300 HP with just Premium fuel at 23 LBS of boost. GM has tried to keep most of their cars Premium Recommended as it helps sales for the many people too cheap to pay a buck or two more at the pump. That is a big deal to many buyers and has scared off people in the past in cars like the Gen I I3800 SC. i couldn’t agree more with you on consumer reports. what a crock of %&*# they are! I don’t care what consumer reports says about cars or trucks! they have lost my respect for them long time ago when they say bad things about good cars because they pick one or two things they think are important! Mr. Scott I remember back in the 80s. GM Tried to add water alcohol injection to the Grand national. They were going to use windshield washer fluid out of the same reservoir. But the feds said they could not put a fuel under the hood with the engine.having a separate tank somewhere Else in the car would have been cost prohibitive. But it’s OK if you use the same water alcohol to clean the windshield then you can have an under the hood. Damn government. What was the maximum boost in your HHR SS before the software update. The max boost was 13-16 PSI depending where I was Altitude wise and the Temp. You are correct on what Buick tried to do. GM also toyed with the idea of NOS as an option on the Monte Carlo SS. Back in those days of low HP companies were getting desperate on some of the engines. Olds did offer water injection on the old 215 Turbo back in the 60’s. I looked at the GS and was seriously considering it. I liked it a lot more than the last gen CTS. Then the ATS came out and one test drive later… I love my ATS!! Buick was on a roll but seems to have slowed a bit…new cars are needed ASAP to keep the interest up. Motley Fool claims Buick has undergone a luxury makeover. That the new product will be a cut above current standards. I’m so curious to see what Buick comes out with and how these cars are received in the US. I take Motley with a grain of salt but Buick is going to see a make over to a little higher standard but so will Opel too. Both divisions are the last of GM divisions to get the make over. Lets face it they have done well with old product so it will be exciting to see what they can do with new platforms. Well, the Regal was the Opel/Vauxhall Insignia 2009 European Car of the Year. So, it didn’t get here until 2010-11; it’s not that old, especially the turbo. But then-President Reuss wanted no claim to German engineering, had the Insignia dumbed-down, and the sales? Headed in the wrong direction. He also missed the CUV/SUV trend looming on the horizon. Best move for Buick’s been importing the rebadged, South Korean Encore, first introduced by Opel as the ‘Mokka’. Dr. Aztek and the rest of the Buick gang would be wise to take Opel’s lead on Buick. Then Dr. Aztek can then continue his intrepid fight for more expensive door handles. That seems to be his strength. This car is a mixed bag for me. Decent AWD system, decent design, decent value and decent performance. Everything else is somewhat disappointing. I’m hoping the next Regal will be even more athletic with a more powerful engine option for the GS model. This current model does hold a lot of potential for the Regal nameplate, therefore my interest for the next gen model is relatively high….. When it comes to Cadillac, it’s imperative all the core models to be RWD or rear-biased AWD. This kind of drive setup in the Regal GS would be unacceptable competing with the Germans in the Cadillac lineup. But this is Buick, and this setup is PERFECT for Buick. Hopefully Buick will produce more GS variants to compete with Volvo’s Polestar and Acura’s top level cars. My only disappointment is that GM didn’t build a Regal GS Coupe or Shooting brake.